Moses Mosop is a Kenyan distance runner, married to fellow marathoner Florence Kiplagat. After showing promise in the junior race of the 2002 IAAF World Cross Country Championships, Mosop joined Renato Canova‘s young squad of athletes to develop his talent. Over the next few years, he progressed his performances to eventually win the bronze medal in the 2005 IAAF World Championship 10,000m race, behind the likes of Kenenisa Bekele. In 2011 Moses Mosop set the world record across the non-standard distances of 25,000m (1:12:25.4) and 30,000m (1:26:47.4) in a 30,000m race on the track. Though these distances are not the most contested, his records still stands (2018). Also in the same year, he and fellow country man Geoffrey Mutai unofficially broke the then existing marathon world record (belong to Haile Gebrselassie) convincingly, being assisted by Boston’s net downhill course in perfect conditions. 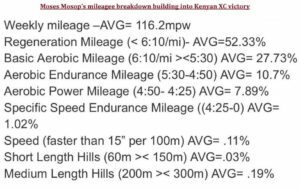 Mosop’s time of 2:03:06 was not accepted due to the in ineligibility of the Boston Marathon as an IAAF official marathon course. Mosop has since won the Chicago marathon and had good placing in other well-known events. He is reported to weigh 50 kg and stand 1.52 m tall. 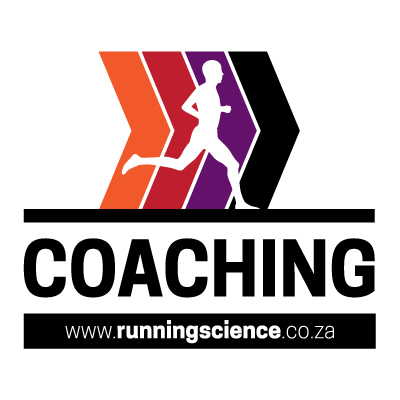 To access separate document with training log’s session pacing as a percentage of predicted marathon finishing time, click here.